To most people, the mere mention of the word “Portrait” conjures up a heavy oil painting featuring some-one else’s relative, peering gloomily out from a dulled gilded frame! Portraits, as with all other forms of artwork, can be executed in a myriad of different materials, on a broad variety of materials and encompassing an even wider spectrum of subjects. I have, of course, illustrated a number of portraits in oils and also in acrylics, but to my mind, the humble pencil, “lifted” by the judicious use of a little ink and colour, can and will, transform this unpretentious form of portraiture, into something extra special. To emphasise my point, I have included two recent canine drawings, each done with an ordinary HB pencil on 240 grade paper. However, as you will notice, I have deliberately made a feature of the eyes, chosing to do them in ink and colour, in order to bring each of the dog’s heads to life. 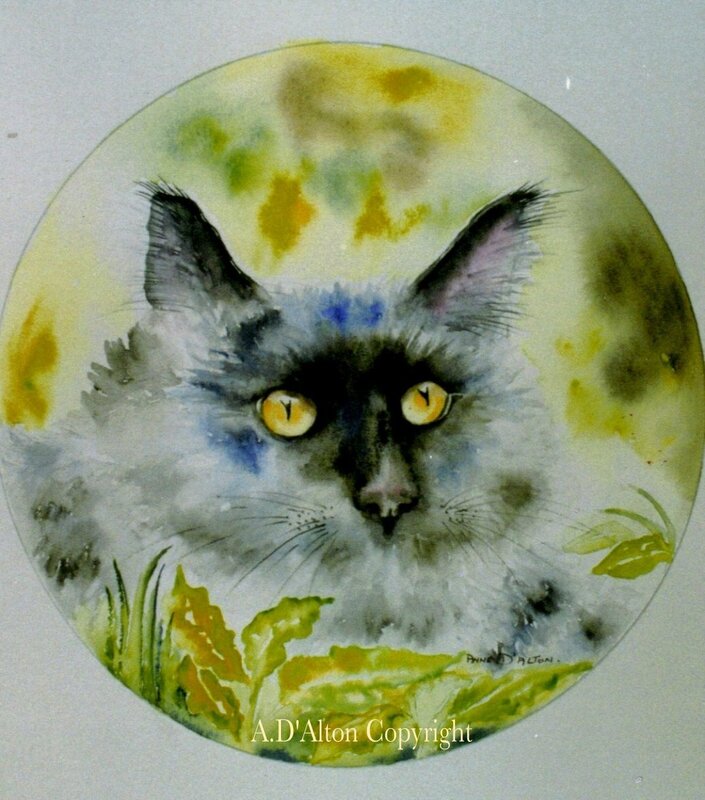 Plus, in order NOT to “muddy the waters” so to speak, I have not filled in any background detail whatsoever, leaving the head with their bright eyes, free to catch the viewer’s attention. 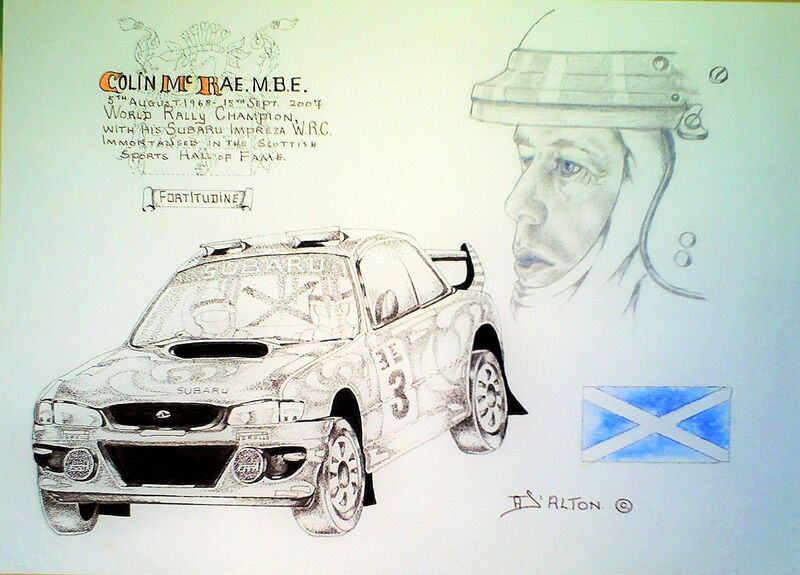 I hope you enjoy these artworks, and please do hot hesitate to contact me, if and when you have any drawing or painting enquiries. My studio will be open from July onwards and you will be more than welcome to see my various artworks on view and to chat about them . Please contact me, however, beforehand. This is an original, but immaculate, 1952, Jaguar XK 140. 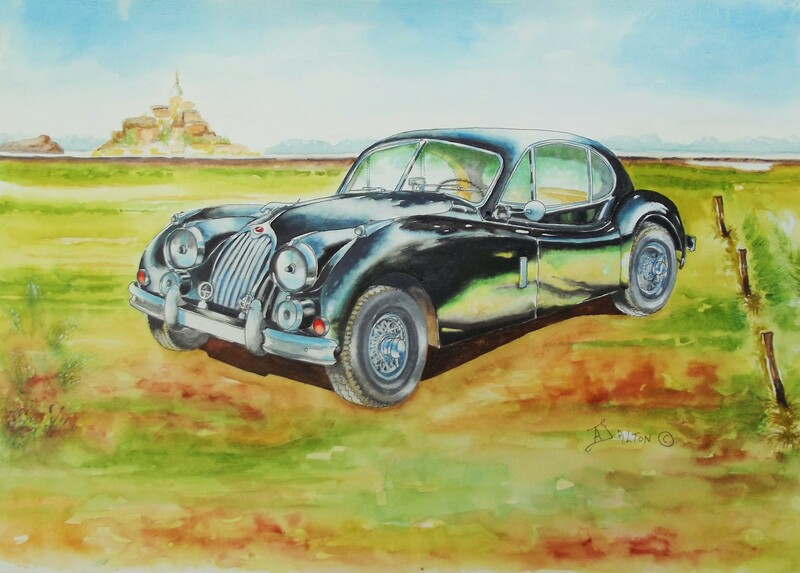 And this lady, comes in B L A C K.
. As a background fitting to the elegance of this wonderful classic vehicle, I have painted in the famous Mont. St. Michel, one of Brittany’s most iconic landmarks. 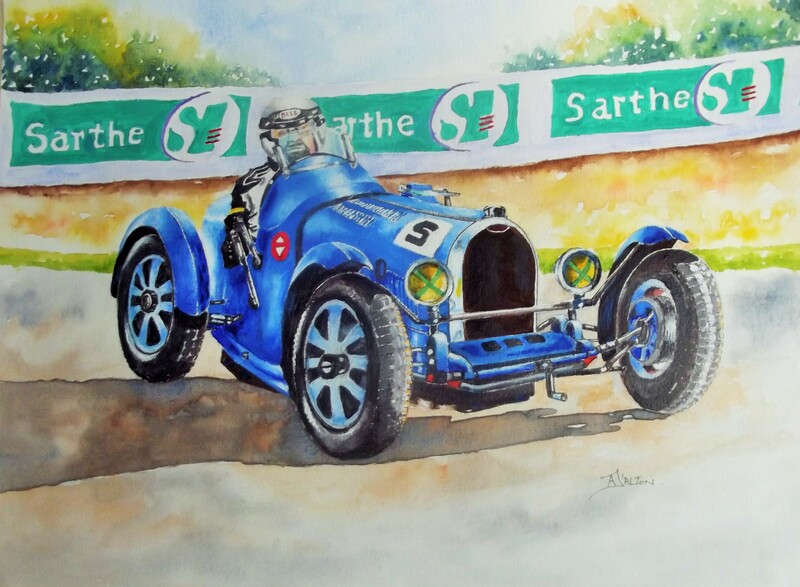 The actual size of this motoring artwork is 42cm x 30cm. 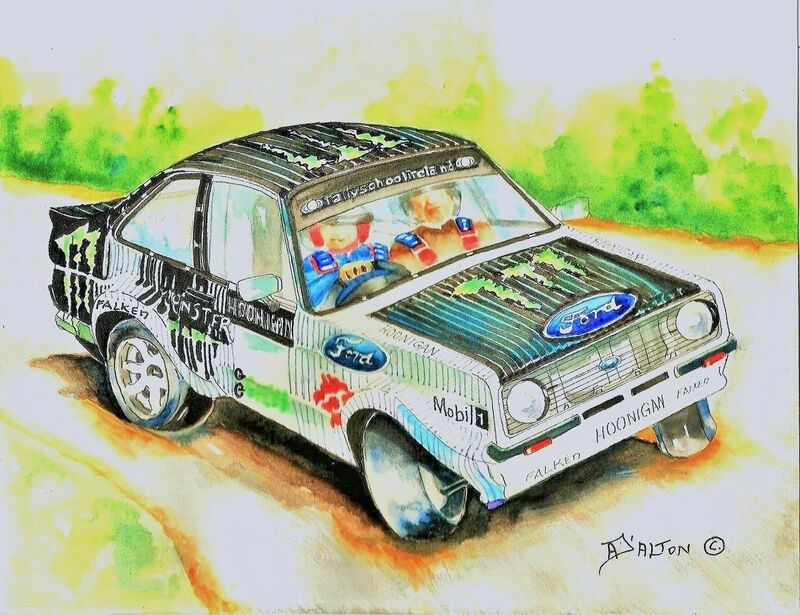 I genuinely enjoy drawing and painting my artworks though it has taken me a while to establish my favourite subject – which is motoring artwork. 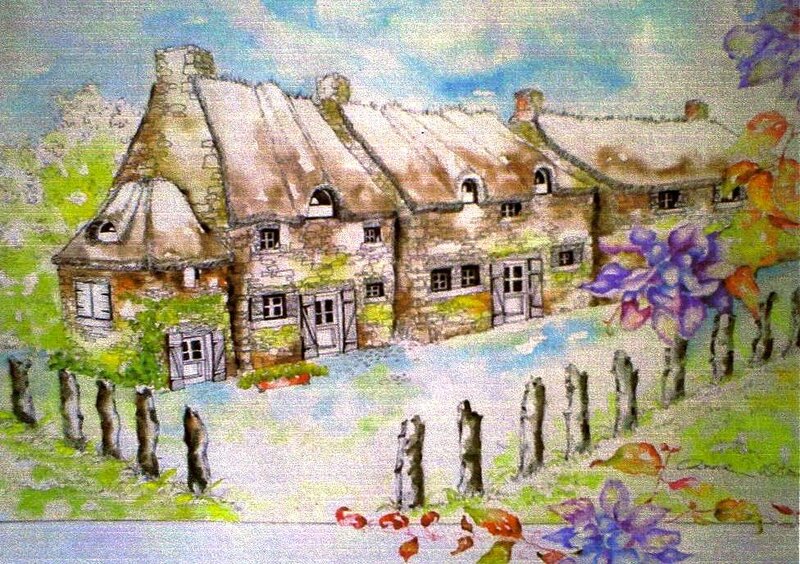 Add this to my interest in draughtsmanship and my own, admittedly “interesting” style of illustration, and you have…..a Motoring Artist who does indeed paint her artwork, from the heart.
. Gouache, I rarely use as it dries out very quickly in this warm climate and I am not enamoured with the rather chalky effect it produces. However, it is in the line of an artist’s work to experiment and in this case, I used this medium, on grained paper, and am quite happy with the result. 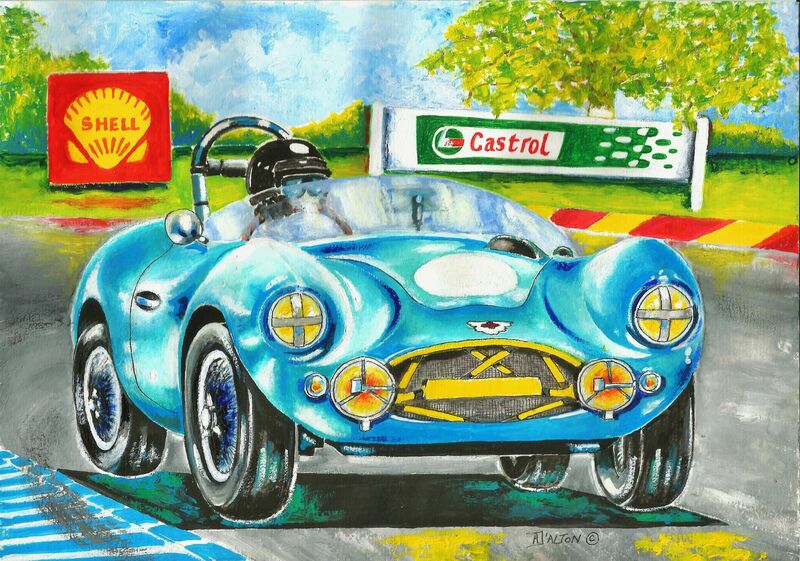 The work in question is a painting of Aston Martin’s glorious DB3S, circa l955, in full song on a circuit. For additional interest, however, I added in the Shell and the Castrol banner of that particular period. Sight, sound and smell of yesteryear.